The connection grid lists all the connections associated with the volunteer opportunity record you're viewing. Each Connection record tracks the contact (volunteer), who has signed up or expressed interest in the volunteer opportunity, and which occurrence (if date and time specific) they are connected to. 1) See who is confirmed to attend a given occurence. 2) Confirm, decline or reschedule volunteers who have expressed interest. So for example, If I wanted to see all the connections for anyone named "Valerie" or all the connections starting or ending on "11/24/2017" - I could type this in the search bar. Alternately - you can use any of the filters in the column heading - to filter the connections to find just the ones matching the filters you choose. Use a combination of search and filters to find just the connections you wish to see. You can also Sort the search/filter results by clicking on the column headers just above the filters. To take action on one or more connections, select the checkbox to indicate which connection you want to take action upon. (Selecting the checkbox at the top left of the grid will select ALL the connections that match your current search and filter (including those on subsequent pages that are not visible to you). 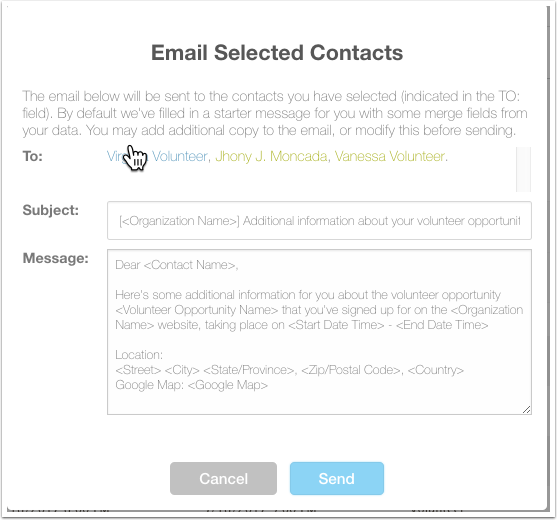 Email Volunteers: will open a window with a default message (complete with merge fields), which you can edit and customize as you wish. All selected volunteers will be sent the email. Note: Some team member contacts do not have email addresses. They will not be sent emails since their email address is unknown. (You may wish to email the team captain and remind him or her to contact their team members with whatever info you have sent). Mark Confirmed or Mark Declined: Date and Time Specific volunteer opportunities with full sign up, automatically confirm a volunteer and notify them that they are confirmed. Opportunities in which a volunteer 'expresses interest" - have their connections created in Pending Stataus. To confirm one or more connections, select them using the check box, and then click the "Mark Confirmed" button. The volunteer will automatically receive an email letting them know they are now confirmed to attend. If you decide you do not want a volunteer to attend, you can select them and click "Mark Declined". If you do this, you will be asked to state a 'decline reason' and then the volunteer will receive an automated email indicating that you have declined them to participate in this opportunity. (The decline reason will not be included in the message). For example - if you want to reschedule the start and end time for an Individually Scheduled Opportunity,, before you confirm the connection, you can click on the start time and/or end time - and an 'edit' icon will appear. Click on this, and you can change the data in this cell. You can also edit the data for Hours Served and/or Guest Volunteers. After you edit one or more connections directly in the grid - you'll need to push the SAVE button to record your changes. You will be unable to confirm or decline connections until you've saved any updates you've made in the connection grid. For Date and Time Specific Opportunities, and Individually Scheduled Opportunities with Schedule - the start date and time and end date and time of the connections will already be populated for you. So you can quickly confirm them. For ISO's that are "Express Interest Only" (EIO) -- the connections are listed with no times. That's because you are just generating a list of volunteers who are interested -- and won't necessarily be scheduling them to attend anything. Nonetheless -- if you DO wish to confirm and schedule a volunteer for an ISO - EIO , you can do so. However, you will need to edit the connection and set a start date and time and end date and time before you can confirm the volunteer - so they will know what day and time you've confirmed them to attend.